PESHAWAR: A single-member Peshawar High Court bench on Friday stayed the execution of a man convicted of attach on law-enforcement agencies by suspending his death sentence awarded by a military court. Justice Syed Arshad Ali issued notices to the defence and interior secretaries and provincial home secretary asking them to produce records of the case of convict Abu Bakar, whose wife Marjan Bibi challenged his sentence in the court. Schedule of the next hearing into the petition will be announced later. The petitioner has claimed that her husband, a resident of Thall tehsil of Hangu district, was illegally detained by security agencies in 2010 and that she recently learned that a military court had awarded death sentence to him. The Inter-Services Public Relations, the media wing of the Pakistan Army, had issued a news release on July 2 announcing the confirmation by the chief of the army staff of the death sentences awarded to 12 terrorists, including Abu Bakar, by the military courts. It had claimed that Abu Bakar, Jannat Gul and Anwar Khan were members of a proscribed militant organisation; they were involved in attacks against law-enforcement agencies and thus, killing five police officials and three civilians, and explosives were also recovered from them. The ISPR had also insisted that the convicts had admitted to their crimes before the magistrate and trial court. Taimur Haider Khan, lawyer for the petitioner, said Abu Bakar was taken away by masked men from near his house with no one knowing about his whereabouts thereafter. He said in 2016, security personnel visited the village and asked people about the convict’s character and conduct and learned that he’d never been involved in any illegal activity. The lawyer said the convict had neither been linked to any proscribed outfit nor was he charged with any illegal activity. He said some relatives told his client on July 3 about the publication of a news item in an Urdu newspaper about the conviction of some people, including Abu Bakar. The lawyer said several provisions of the Constitution were violated in the case, while the convict was not given a fair trial, which was mandatory under Article 10-A of the Constitution. ACQUITTED: An anti-terrorism court has acquitted two people of extortion. Judge Sabir Khan ruled that the prosecution didn’t prove the case against the accused, including Kafiullah and Mohammad Hussain, while the evidence on record didn’t connect them with the commission of the offence. 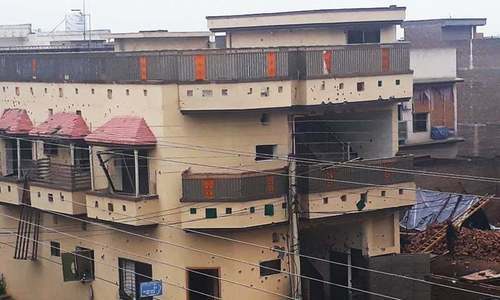 Defence lawyer Shabbir Hussain Gigyani said the counter-terrorism department had charged the two with trying to extort Rs10 million from flour mills owner Mohammad Hussain and sending them a hand grenade and a shroud. He claimed that there existed no solid evidence against his clients and that the prosecution witnesses had recorded conflicting statements.